Born into a privileged household, Beatrix Potter was educated by governesses and grew up isolated from other children. She had numerous pets and spent holidays in Scotland and the Lake District, developing a love of landscape, flora and fauna, all of which she closely observed and painted. Her parents discouraged her intellectual development as a young woman, but her study and watercolors of fungi led to her being widely respected in the field of mycology. In her thirties, Potter published the highly successful children's book, The Tale of Peter Rabbit. Potter began writing and illustrating children's books full-time. With the proceeds from the books and a legacy from an aunt, Potter bought Hill Top Farm in Near Sawrey, a village of Lancashire in the Lake District in 1905. Over the following decades, she purchased additional farms to preserve the unique hill country landscape. In 1913, at the age of 47, she married William Heelis, a respected local solicitor from Hawkshead. Potter was also a prize-winning breeder of Herdwick sheep and a prosperous farmer keenly interested in land preservation. She continued to write and illustrate, and to design spin-off merchandise based on her children's books for Warne, until the duties of land management and her diminishing eyesight made it difficult to continue. Potter wrote about 30 books; the best known being her 24 children's tales. She died at her home in Near Sawrey (Lancashire) at age 77, leaving almost all her property to the National Trust. She is credited with preserving much of the land that now comprises the Lake District National Park. Step inside this charming old building to enjoy an exhibition of Beatrix Potter's original drawings and watercolours. This year the new exhibition celebrates the 150th anniversary of the birth of Beatrix Potter and displays original artwork inspired by her love of nature. A visit here is an ideal addition to a Hill Top visit as it doesn't just offer the chance to admire her delightful artwork but also the opportunity to learn more about Beatrix Potter's life outside the writing career which made her famous. Learn more about Beatrix as a farmer and conservationist and how her legacy helped to keep the Lake District the place we know today. This gallery building has an interesting history too, as previously it was the office of Beatrix Potter's husband William Heelis, and it is a rare opportunity to see inside one of Hawkshead's old buildings. Accessible car park in Hawkshead village (not National Trust). Approx 300 yards from Gallery. Braille Guide and Large print guide. Exhibition housed in old property entered from street, step to narrow entrance. Level access to three rooms on ground floor. Illustrations are upstairs, objects relating to Beatrix Potter downstairs. Many stairs with handrail to other floors. Assistance dogs only are welcomed. 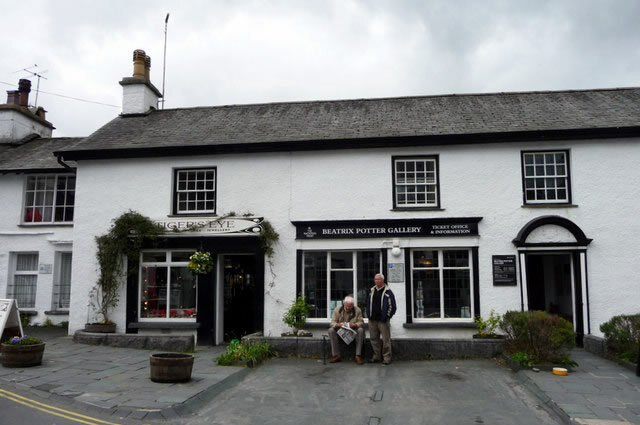 While you are in Hawkshead why not visit the Hawkshead Grammar School Museum (dating back to the 17th Century) and Hilltop, Beatrix Potters home. Hill Top is a 17th-century house in Near Sawrey near Hawkshead, in the English county of Cumbria. It is an example of Lakeland vernacular architecture with random stone walls and slate roof. The house was once the home of children's author and illustrator Beatrix Potter who left it to the National Trust. It is a Grade II* listed building. It is open to the public as a writer's house museum, shown as Beatrix Potter herself would have known it. Hill Top once belonged to Beatrix Potter, the children's author and illustrator known for the series of small format Peter Rabbit books. Potter bought the house and its 34-acre (14 ha) working farm in July 1906 as her home away from London and her artistic retreat. She left the house to the National Trust. The house, farm and nearby villages feature in Potter's books, The Tale of the Pie and the Patty-Pan, The Tale of Tom Kitten, The Tale of Jemima Puddle-Duck and The Tale of Samuel Whiskers or The Roly-Poly Pudding. The farm was managed by John Cannon. The wing on the left was built by Potter for Cannon and his family in 1906. The Tale of Jemima Puddle-Duck was dedicated to his children, Ralph and Betsy, who appear in the illustrations, as does their mother. The entrance hall retains its original stone-flagged floor. The range seen in many of her illustrations was removed but replaced with an identical one in 1983. The wallpaper was reproduced in 1987 from that hung by Potter in 1906 and covers the walls and ceiling. The longcase clock dated ca. 1785, the Chippendale-style chairs, the Georgian-style dresser, a 17th-century oak press cupboard and other furnishings are depicted in some of Potter's illustrations. The parlour is distinguished by an Adam style chimneypiece installed by Potter. Furniture of the early 19th century dominates the room and 18th century English and Chinese porcelains are displayed in a hanging wall cupboard. Potter's 1902 coronation teapot displayed in the cupboard was Ribby's in The Tale of the Pie and the Patty-Pan. The staircase and landing are familiar to the readers of Potter's books. The rail and banisters are probably 18th century. The walnut longcase clock was made by Schofield's of Rochdale. Other works of art decorate the area. The carpets were woven to match those in The Tale of Samuel Whiskers. In 2007 a replica of Hill Top was built in a children's zoo near the grounds of Daito Bunka University in Tokyo, Japan. Enjoy the tale of Beatrix Potter by visiting Hill Top. Full of her favourite things, this house appears as if Beatrix had just stepped out for a walk. Every room contains a reference to a picture in a 'tale'. The lovely cottage garden is a haphazard mix of flowers, herbs, fruit and vegetables. Make your way up the garden path to the front door and see for yourself why Beatrix loved this place. Bought in 1905 with proceeds from her first book, the Tale of Peter Rabbit, she used Hill Top itself and the surrounding countryside as inspiration for many of her subsequent books. Hill Top is a small house and a timed-ticket system is in operation to avoid overcrowding and to protect the interior. Hill Top can be very busy and visitors may sometimes have to wait to enter the house. Limited car parking spaces. 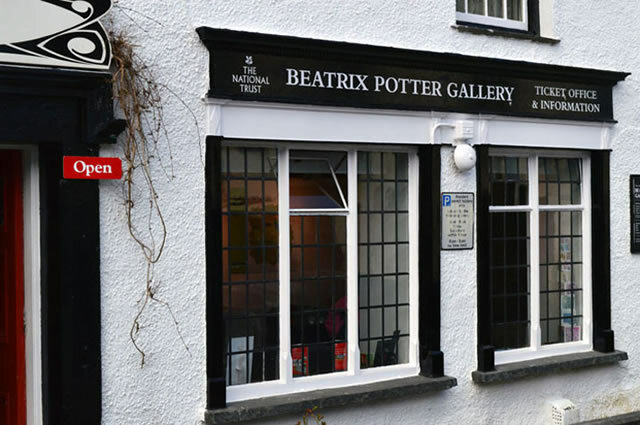 The shop specialises in Beatrix Potter-related items. Sawrey House Hotel/Tower Bank Arms serve meals and drinks. Dogs welcome in the welcome area only, not the house or garden. Grounds, including toilets partly accessible, some steps, uneven paths. Assistance dogs only. Building - many steps with handrail to first floor. Lighting in the house can be dark on dull days. It may take a few moments for your eyes to adjust. Seasonal Windermere Lake Cruise service from Bowness Pier 3 to Windermere west shore. Call 015394 43360 for details. Or Windermere car ferry, regular services. See www.cumbria.gov.uk for more information. Location : Main Street, Hawkshead, Cumbria, LA22 0NS. Transport: Windemere (National Rail) then Stagecoach in Cumbria bus 550. Cross Lakes Shuttle bus from Bowness. Opening Times: Weekdays 10:00 to 17:00. 30th March to 26th August. Opening Times Hill Top: Daily 10:00 to 16:30. March through October; until 17:00 in summer. Tickets : Adults £6.00 Children (5-15) £3.00. Tickets Hill Top : Adults £10.40 Children (5-15) £5.20.